Republican presidential candidate Donald Trump has heaped praise on Pope Francis, hours after the pontiff questioned his Christian faith over his vow to build a border wall with Mexico. The billionaire struck a more conciliatory tone after earlier calling the Pope's comments "disgraceful". He was also challenged over his opposition to the 2003 invasion of Iraq at a town hall event in South Carolina. Republican voters in the US state will make their presidential choice in days. Mr Trump leads the South Carolina polls and he took to a stage in Columbia on Thursday evening to answer questions on national television, hours after his row with the Pope unfolded. The Pope had said Mr Trump's proposal to build a wall on the US border with Mexico was not Christian, provoking a strong response from the businessman. When asked about his row with the Pope, he said he wouldn't describe it as a fight, although he later said he didn't like fighting with him. Did Mr Trump need to take on the Pope? Well, almost certainly yes. Because in God-fearing South Carolina, the next state to vote in the primary process - to have the Pope say that he is un-Christian is potentially very damaging. And over the course of the campaign, the billionaire property developer has been at pains to prove his religious credentials, appearing at rallies with a copy of the Bible that his mother had given him as a child. Trump v Pope... who wins? "I have a lot of respect for the Pope. He has a lot of personality and I think he's doing a very good job, he has a lot of energy." He said the pontiff was misinformed when he criticised the proposed wall, because he was not aware of the drugs coming in and the other security problems that made a strong border a necessity. Media captionPope Francis: "A person who thinks only about building walls... is not Christian"
Earlier in the day, Pope Francis said "a person who thinks only about building walls... and not of building bridges, is not Christian". That was roundly condemned by Mr Trump, who issued a statement in which he called the comments "disgraceful". His anti-immigration stance is a central plank in his campaign - he wants to deport 11 million undocumented migrants and said Muslims should be temporarily barred from coming to the US. He was also questioned about his opposition to the invasion of Iraq in 2003, after he was confronted with a radio interview from 2002 in which he had said he supported military action there. Asked about the accuracy of the report, Mr Trump admitted "I could have said that". He said he was not a politician at the time of the interview and "it was probably the first time anybody asked me that question...by the time the war started, I was against the war". Just minutes earlier he had slammed former President George W Bush for going into Iraq saying "it may have been the worst decision anybody has made, any president has made in the history of this country, that's how bad it is". He also refused to say whether Mr Bush had lied about the existence of weapons of mass destruction before invading Iraq, despite saying this at the last Republican debate. Republicans in South Carolina and Democratic voters in Nevada will choose their presidential candidates on Saturday. Mr Trump, who has no political experience but won in New Hampshire, is the clear frontrunner in the Republican vote. George W Bush's younger brother Jeb Bush is one of Mr Trump's rivals for the White House, but his main threat comes from Texas Senator Ted Cruz, who won the Iowa caucus. The Democratic race in Nevada has Hillary Clinton and Bernie Sanders neck-and-neck. Mrs Clinton, speaking in Las Vegas on Thursday evening, condemned Mr Trump for his "prejudice and paranoia". 22 things that Donald Trump believes - What are his policies and beliefs? 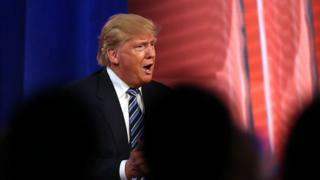 Trump turns notoriety into a win - After New Hampshire, is Mr Trump unstoppable?